The Rotary Foundation in a nutshell - click here. - economic and community development. Find out more at Foundation. 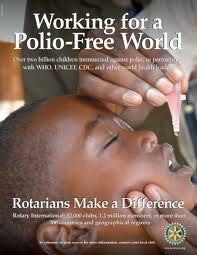 We look forward to the day when polio is a disease of the past. We are almost there! There has been a 99% reduction in polio cases worldwide since the first Rotary program to vaccinate children in the Philippines in 1979. Read more about this amazing public health achievement at Polio and help us fight the fight against polio. The Rotary Foundation provides life changing Global Scholarships and Peace Fellowships. Woden Daybreak has hosted Global Scholars from the USA and Trinidad Tobago and sent them to Ireland and the USA. We have also sponsored a Peace Fellow to study at the Peace Centre in Thailand. We attend the annual Peace Fellows dinner in Canberra at which Peace Fellows from around the world speak to us. What an inspirational and moving event. Click on Foundation Scholars and Peace Fellows for more information.